Profile: A clanking, crushing terror that destroys all in his path, Menasor is the ultimate Decepticon weapon - or, in theory at least, should be. For underneath his thick-plated hide is a mind wracked by indecision and conflict. All his actions are the hard-fought results of this ongoing internal struggle. Menasor is designed to mesh the thoughts of his five Stunticon components - Motormaster, Dead End, Breakdown, Drag Strip, and Wildrider - into one single-minded destruction machine. 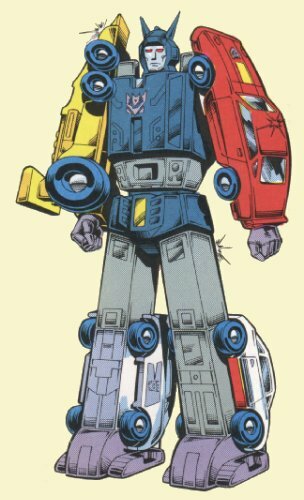 But Motormaster is so thoroughly loathed by the other four that a mental rift develops within Menasor, giving him a violently unstable personality. Although he strives to perform his lethal duties, Menasor is sometimes too confused to do anything but haphazardly lash out at anything near him. At these times his hands reach for his head as he strains to clear his thoughts. Like a child throwing a tantrum, he is at his most uncontrollable in this state - and also his most dangerous. Abilities: Menasor has tremendous strength - he can punch with a force of 140 tons. His armor is nearly impervious to all but the most powerful artillery. He uses Motormaster's cyclone gun to blow through Autobot barriers and carries a silver sword to slice through whatever's left. Weaknesses: Menasor's split personality is often a severe handicap to his successful operation. His lumbering, slow gait makes him an easy target - but he's still a tough nut to crack.